Format Factory has gained great reputation for its superb audio and video converting performance. However, such excellent video converter only runs on Windows platform. So if you are working with a Mac OS, the use of Format Factory will lead to Waterloo. Worse still, there is no sign indicates Free Time makes Format Factory for Mac into its development schedule. In this case, if you've dream of converting video on Mac using a similar program, you'd better download an alternative to Format Factory for Mac version beforehand. Free Download Top Mac Alternative to Format Factory Here! Anyway, no Mac version of Format Factory is for you to convert videos on Mac computer. To achieve video conversion on Mac, you are suggested to free download the top alternative to Format Factory for Mac - MacX Video Converter Pro, a strong performer to let you convert all videos like AVCHD, MTS, M2TS, MKV, WMV, MP4, MOV, FLV, AVI, H264, H265/HEVC, etc to 180+ video and 14+ audio formats on Mac (macOS Mojave). What's even better, it works seamlessly as a video downloader to free download videos from YouTube, Vimeo, Vevo, Dailymotion, Facebook, etc. 300+ sites with whatever format and resolution to iPhone X/8/7/Plus, iPad Pro, iPad Mini/Air series, Android Samsung, Sony, HTC, Nokia, Microsoft, Google, etc. mobile devices with No.1 fast speed (3-Level Hardware Acceleration supported). After finishing best alternative to Format Factory for Mac download, run it. The primary window of this replacement to Format Factory Mac version is pretty easy to navigate. Click "Add File" to select file you want to convert. This Format Factory similar program also supports batch conversion, so you can import and convert several files at a time. By the way, you are also enabled to download YouTube videos Mac by hitting the "YouTube" button on the top left part of this tool. Take the output format you want. In addition, you can tweak resolution, bit rate and other video settings for better video quality. Tips: The awesome "Edit" feature in this alternative to Format Factory lets you trim, crop, merge videos and even add watermark and subtitle to your video before conversion. Click "RUN" button to start video conversion with this great alternative to Format Factory for Mac. The conversion speed is fast and video quality is awesome. This is definitely the best program works like Format Factory on Mac. HD videos: AVCHD, MTS, M2TS, TS, MKV, TOD, MOD, etc; SD videos: MP4, MOV, M4V, AVI, FLV, AVC, MPEG, WMV, MKV, MPEG2, MPEG1, RM, 3G2, 3GP, ASF, F4V, DV, SWF, WEBM. Directly offer presettings for iPhone (iPhone 6S/6S Plus/SE/5S/5C/5/4s/4/3GS), iPad (iPad Air, iPad Mini with Retina, iPad Mini, iPad 4/3/2), iPod (iPod Touch, iPod Nano), Apple TV, Xbox, PS4, Android, Samsung, BlackBerry, Zen, and more. Download video from YouTube, Myspace, Metacafe and other 300+ online sites. Mac OS X Tiger/Leopard/Snow L eopard/Lion/Mountain Lion/Mavericks/Yosemite/El Capitan/macOS Sierra; For Windows version, you can free download video converter for Windows. Superior to Format Factory, the Mac version of this best video converter for Mac also has many attracting features, for example, capture streaming video on Mac, record screen HD videos, convert videos directly to iMovies, iPhone, iPad, iPod, Android, etc while holding the optimal video quality you prefer. What's more, Multi-core CPU and Hyper-threading technology ensures amazingly superfast video converting speed on your Mac computer. Note: After you finish the video conversion task on Mac, you can apply a topmost iOS data transfer - MacX MediaTrans to move videos/music from computer to iPhone iPad iPod for enjoying on the move. Besides, this iPhone file manager also is able to copy video from iOS devices to Mac or even transfer photos from iPhone to Mac. Download XMeida Recode Mac alternative to convert any videos and audios on Mac OS X (El Capitan/macOS Sierra incl.) effortlessly, and it lets you free from the predicament that you are unable to convert videos via XMedia Recode Mac. 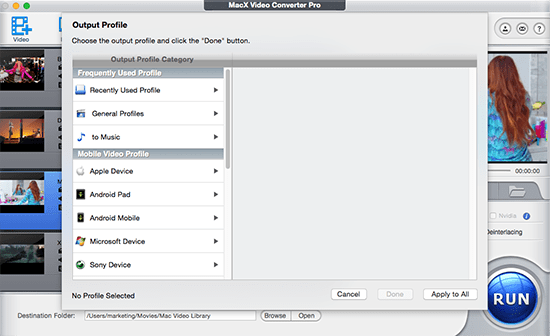 MacX Video Converter Pro is an affordable way to convert videos on Mac, assuming you have tons of video files waiting for conversion, like MP4, MKV, MOV, AVI, FLV, AVCHD, etc. It not only does the video conversion thing, but also does a good job in video downloading, video editing, video recording, photo slideshow making, etc.